Timeslots explores the reconfiguration of painting through perceptions of temporality. 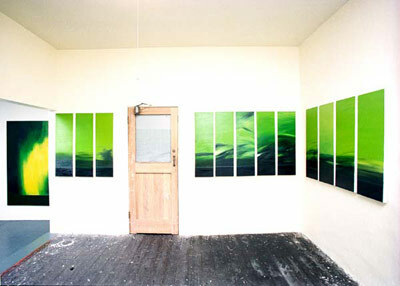 Phenomena such as the aurorae borealis, explosions, rocket launches, astronomy and film are some of the sources of the investigation in the multi-panelled installation. The situation on Spencer street was a crucial component; the traffic unrelenting. To the drone of passing traffic Unreeling & Orb hurled itself. Consisting of two long and narrow canvases, the first panel, Unreeling, features an accelerated light force rocketing across the surface like a land-bound comet. Its partner, Orb, refers to nocturnes, the romantic landscape, supernovae and microscopic organisms and creates a sense of suspense.